Hello...again! I am bringing you a second card today for another challenge I did - this is also my weekly contribution for Sunshine's Stamps. If you love this little heart and would like one of your own, you can get it at the Sunshine's Stamps store. 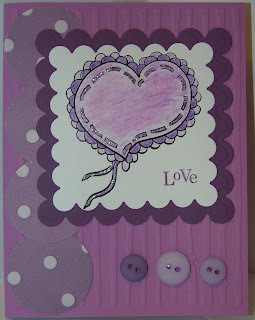 The challenge is for Show and Tell Cards and Scrap Pages Challenge #3. The theme is monochromatic. Easier than it sounds, but I really like the results! Materials are image - Sunshine's stamps colored in with SU watercolor pencils blended with a blender pen. Clear Stickles, misc buttons. CS is SU Orchid Opulence and Perfect Plum. Very nice job. I love the circle punch border. Great job with the challenge. Very nice! Love the idea of the circles down the side! Love your card, it turned out great! great card. I love how you incorporated the buttons.